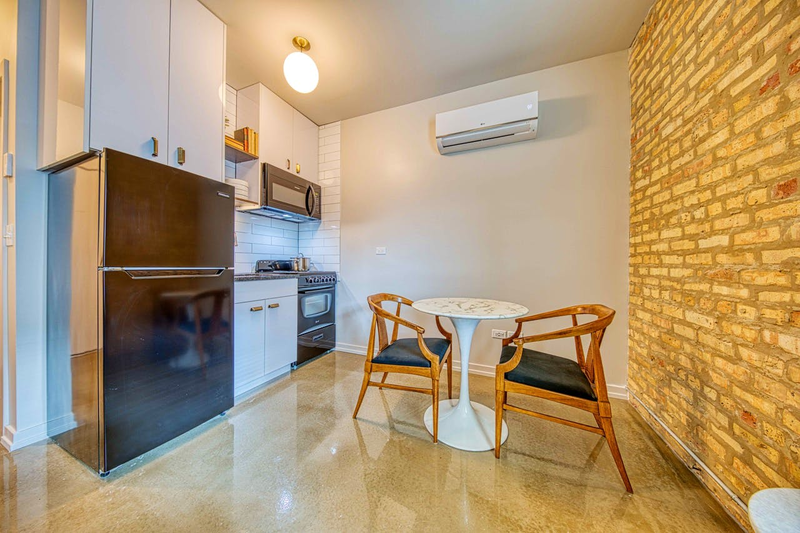 What does $1,100 rent you in Logan Square, today? Curious just how far your dollar goes in Logan Square? According to Walk Score, this Chicago neighborhood is quite walkable, is easy to get around on a bicycle and boasts excellent transit options. Data from rental site Zumper shows that the median rent for a one bedroom in Logan Square is currently hovering around $1,395. Listed at $1,100/month, this 1,000-square-foot one-bedroom, one-bathroom unit is located at 2445 N. Drake Ave., #1f. In the unit, there are hardwood flooring, bay windows, air conditioning, over-sized windows and an eat-in kitchen. Pet owners, inquire elsewhere: this spot doesn't allow cats or dogs. Here's a 550-square-foot studio apartment at 3263 W. Wrightwood Ave., #1-R that's going for $1,095/month. Apartment amenities include hardwood floors, high ceilings, a ceiling fan and ample closet space. The building offers on-site laundry and outdoor space. Attention, cat owners: your kitty is welcome here. Next, check out this studio apartment that's located at 2617 N. Spaulding Ave. It's also listed for $1,095/month. In the unit, you'll get hardwood floors, high ceilings, a walk-in closet, high ceilings and wooden cabinets. The building boasts on-site laundry, storage space, secured entry and on-site management. Luckily for pet owners, both dogs and cats are welcome. The listing specifies a $300 move-in fee, $300 pet fee. Located at 3308 W. Palmer St., here's a one-bedroom, one-bathroom apartment that's listed for $1,075/month. The apartment features hardwood floors, built-in shelves, a decorative fireplace and an eat-in kitchen. The building has on-site laundry; Luckily for pet owners, both dogs and cats are welcome. Here's a zero-bedroom, one-bathroom apartment at North Avenue that's going for $1,025/month. In the apartment, there are hardwood floors, in-unit laundry, a walk-in closet, exposed brick and an eat-in kitchen. For those with furry friends in tow, know that cats and dogs are welcome on this property.